Christmas exists in Tokyo as it does at home, there are Christmas trees, decorations and Kentucky Fried Chicken?! Well, maybe it is not exactly like home but Christmas does exist in Japan. In Japan, Christmas is a commercial holiday revolving around romance, cakes and fried chicken. Christmas trees are not all that common in one’s living room but expect to find department stores and malls to be decorated in extravagant lighting, ribbons and other stunning decorations. 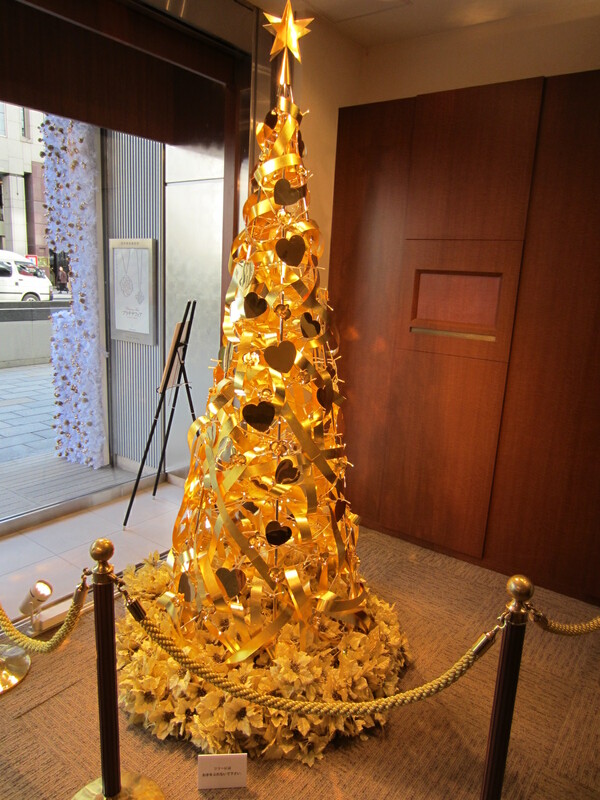 In fact, last week Ginza Tanaka in Tokyo’s Ginza district unveiled an eight-foot tall Christmas Tree made out of 26 pounds of gold as well as other precious metals. The tree was a joint project between the store and floral arrangement artist Shogo Kariyazaki. The tree is estimated to be worth $2 million. It is on display for the public, and would a great and certainly unique spot to stop by while in Tokyo over the holidays. Clearly decorations are important part of the holidays but just as important are the Christmas cake and dinner. 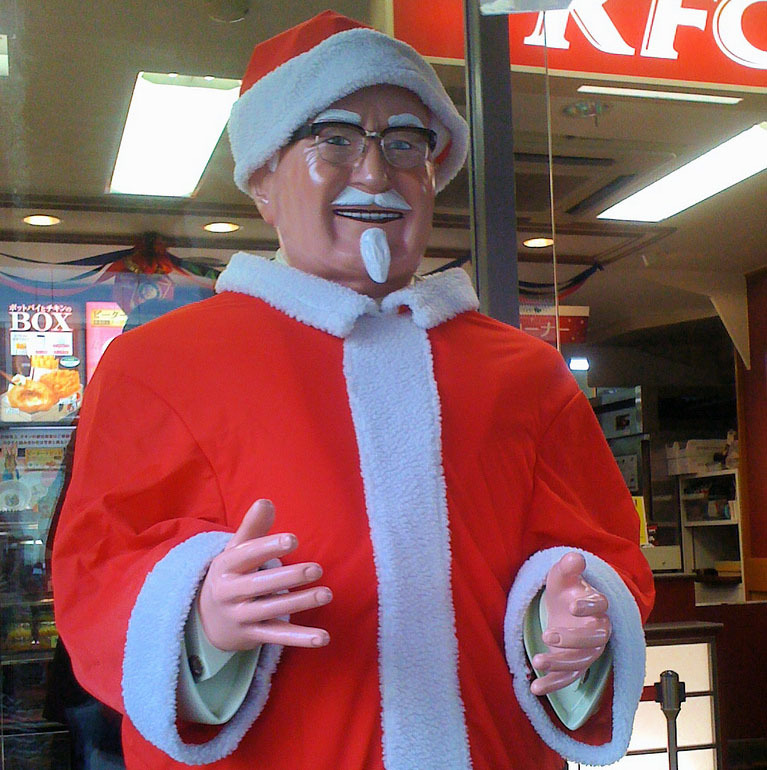 Back in 1974 Kentucky Fried Chicken (KFC) began a marketing campaign with the simple phrase “Kentucky for Christmas”. That one phrase has led to KFC becoming a Christmas Eve “tradition”. Today you can reserve your chicken up to a month in advance to avoid the long lines outside the stores where even back office staff come out to help serve the thousands of customers at every store. During this period KFC’s sales are five to ten times higher than average. If you are in Tokyo stop by KFC and take a photo with Santa Clause “Colonel Sanders”. No Christmas dinner is complete without a dessert: Strawberry Shortcake brought home by the father who was lucky enough to get the evening off work, or otherwise the mother. Christmas is not a holiday in Japan so work, school and daily life does not stop. The cake can be bought at any cake shop, supermarket or even at one of Tokyo‘s thousands of convenience stores. Employees at convenience stores often dress up in Santa outfits and stand outside selling cakes. If you do not feel like Strawberry Shortcake on Christmas Eve, try some on December 25th when their prices plummet as stores rush to get rid of the leftovers to open up space for New Year’s goods (one of Japan’s most important national holidays). 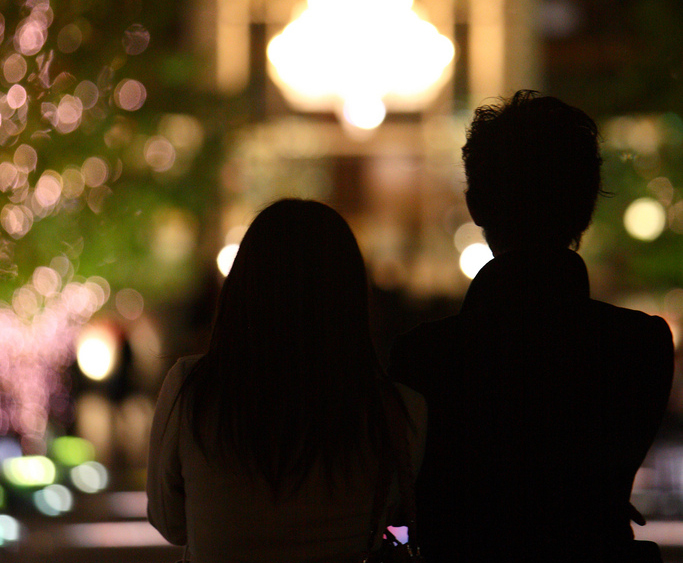 Christmas is also the most romantic time of the year in Japan. With all department stores decorated and lights lining the main streets girls dream of a date at a fancy restaurant on Christmas Eve. This is so important that not having a date is a nightmare for many young Japanese. It is a stark contrast from what many people in the Americas and Europe see as Christmas; nonetheless it is a great one-time opportunity to experience something different. So make sure to grab some KFC and Strawberry Shortcake and don’t forget your mTrip Tokyo App as to not miss out on any of Tokyo‘s glittering attractions.